A designated beneficiary on one of these forms is critical because not a will or even a court order will trump it. The accounts will be distributed according to the decedent’s designated beneficiary form. How does this happen? The designated beneficiary forms are typically buried in the paperwork you sign when you open a checking account, IRA or 401(k). 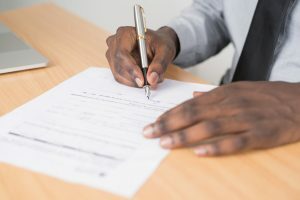 If you opened these accounts before you got married or got divorced or had a child yet failed to update those forms, your loved ones/heirs may need to go through probate litigation to receive the full contents of those accounts. In cases where an ex-spouse is designated as a beneficiary, it can spark a dispute between that person decedent’s new spouse, children or other heirs. There are, however, some protections written into federal law for 401(k)s.
ERISA, also known as the Employee Retirement Income Security Act, typically governs retirement and pension accounts and stipulates that if the owner of a retirement account was married when he or she died, that spouse is automatically going to receive half of whatever money is in that account. This is true regardless of the beneficiary designation on the account. So let’s say an ex-spouse is listed on a retirement account but decedent had remarried and simply forgotten to update the form. Decedent’s spouse will be entitled to 50 percent of the contents of that account no matter what. Spouses can in some cases waive their right to the contents of an account, but there are some cases where that’s not allowed under ERISA. IRAs, meanwhile, are state-controlled, meaning individuals have more flexibility to name whomever they choose as a beneficiary, regardless of whether a spouse concedes. It’s important to update your designated beneficiary form after significant life events. For example, if you divorce, your ex may agree in a court order to forego any right to your future retirement accounts. However, if you don’t update the designated beneficiary form, that order from the divorce court won’t matter. Proper designation of a beneficiary is imperative if you want to make sure the contents of those accounts is available right away to those whom you have designated and that they will not need to go through the process of probate litigation to obtain it. If you are an heir who has come up against this legal roadblock, our Fort Lauderdale probate lawyers can help.